Starting Jan 1, 2019 the new trash hauler Advanced Disposal will start pick up. On 12/31/2018 the contract with JP Mascaro will be ending. Advanced Disposal will be the new trash hauler for the Borough of Souderton for the next 3 (three) years. Listed below are a few items that will be helpful for residents in regards to the hauler change over. All JP Mascaro totes have been picked up. If for any reason you still have your JP Mascaro totes please contact our office so we can get them picked up. Advanced Disposal has dropped off your new trash & recycle totes. If you haven’t received your new totes yet please email our office info@soudertonborough.org or call 215-723-4371. Please click on Holiday Schedule The next delay in service will be on Memorial Day. The Bag Recycle program will be changing. The rate will change to $20.00 per quarter. Residents will have a roll of 5 bags delivered in January and July. The cost for any additional bags needed will increase to $5.00 per bag. Additional bags may still be purchased at the Borough office. The Cost for Standard Weekly Service Trash Recycling Tote Service (Full Service) will stay the same at $60.00 per quarter per unit. What day will my trash and recycling be collected? Please make sure your totes are out by 6 am on day of collection. Have the wheels on your Trash and recycle totes towards your property. The lid should open towards the road or alley. Please contact the Borough office 215-723-4371 with issues with trash pick-up or questions about pick up. Thursday will be the pickup day for those residents located North of East Chestnut Street and West Broad Street. Friday will be the pickup day for those residents located South of East Chestnut Street South and South of West Broad Street. Click TRASH COLLECTION MAP 2019-2022 to view the map. Why did my Trash/ Recycling not get picked up? The most common reason your trash or recycling didn’t get picked up is that the cans aren’t to the edge of the property or totes are facing the correct direction. Trash hauler will not come on to your property to get the totes. Totes need to be moved from next to the garage to edge of property. If in an alley totes should be at end of parking area where alley meets parking area. Also trash hauler will not return the totes back on to your property they will put them back on the edge of the property. Second most common reason that your totes aren’t getting picked up is because they are blocked. Please make sure that your car, mailboxes, poles, or lampposts aren’t blocking your totes. One reasons that your Trash is picked up and not your Recycling would be: you have non recyclable items in your recycling can. Please review the list of recyclable items below. Do not put anything you do not wish to be picked up near your totes. For example, lawn chairs, portable basketball hoops, bicycles, etc. There are a few other reasons why your trash or recycle wasn’t pick up. These reasons are listed on the Notice of Non Compliance please click below for more reasons. Trash hauler has been putting Notice of Non-Compliance for curbside collection notices on your cans if they find issues. Please review the notice and make the changes needed to comply so that they will continue to pick up your trash/recycling. When will I get my bill? And who will be billing me? The bills will be mailed quarterly. Just like the sewer bills, trash service bills are payable to Souderton Borough. Payments can be made in person or by mail. Payments can be made by cash, check or credit card. All card payments have a fee of 2.45 % min of $3.00 that Munici-pay retains. The borough doesn’t keep the processing fee. When paying by check Sewer payments and Trash payments must be paid on two separate checks. Souderton Borough prefers both Trash and Sewer services mailing to go to the property owner or property manager. 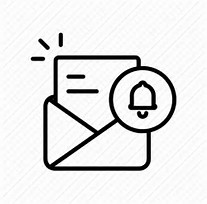 If you are a property owner and request to have a utility bill mailed to the occupant of your property you must understand regardless of who resides at your property the owner of the property will always be responsible for unpaid invoices. Where can I purchase my bags? The bags are available for purchase at the Souderton Borough Office. The specially marked bags are $5.00 per bag. Click here for a photo of the bag. No more than 1 bag can be placed out on the curb per week. Please note: If you have more than one of trash per week, it may be beneficial to go with the Standard Weekly Service Trash Recycling Tote Service. 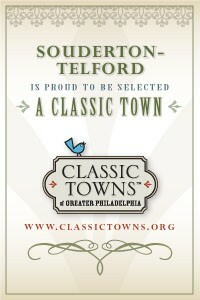 I just moved into Souderton Borough. What should I do? At settlement you should have received a copy of the trash form please update that form and return it to our office. You can either Fax it 215-723-5569, mail it, or email it to us. If you move in in the middle of a quarter if the seller already paid for full quarter you will pay them for the rest of your quarter, we will not be prorating the bills. If there is a outstanding balance you will have to get that amount from seller at settlement for their part of that quarter. If you have misplaced your letter please print form and send it in to office. Ordinance no 15-720-03 Waste Collection and Recycling requires all residents and property owners to have Recycling and Trash Collection. State and Municipal regulations require all residents and property owners to recycle. Residents can now recycle more and throw away less waste with a larger wheeled tote for recycling. You were provided with a new 64 gallon toter for recyclable materials. Recyclables can be mixed together. No Sorting needed and please don’t bag your recyclables. Items that can be recycled are: newspapers, inserts & junk mail, magazines, catalogs and envelopes, paper back books and phone books, cardboard, clean glass, office & school papers (colored paper), box board (Cereal, cake, & cracker boxes), paper egg cartons, paper bags, aluminum cans & clean foil, tin & empty steel aerosol cans, and all plastic containers labeled #1-#7. Items NOT to recycle: Garbage, plastic bags, food waster, Styrofoam, motor oil, plastic toys, batteries, electronics, CD/DVD, egg cartons, hangers, empty glass jars & bottles, and yard waste. 12 items not to put in your recycling container. Recycle Right-Helpful information from Advanced Disposal on recycling. Not sure about an item. Check the link on how to dispose of a certain item. What is Collected to be Recycled printable list of Recyclables. All Dates are on our Calendar on this website on the left hand side. Below are printable flyers for each event. Paper Shredding information. 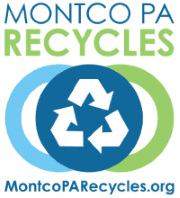 Please go to their website https://www.montcopa.org/1998/Paper to find location to recycle paper. Branch pick up: Borough will still pick up leaves and branches as they have been doing. Pick up will start the first Monday of the Month. No Alley pick up. Must be out front or on side street. Branch sizes should be 1-6 inches in diameter and 1-8 foot in length. No root-balls, shrubs, logs or stumps. They must be neatly piled on the curb for easy pick up. They shouldn’t have leaves or other debris mixed in with them. Twigs smaller than 1 inch maybe disposed of in your trash tote. Please contact the Borough office prior to the first Monday of the month so you can be added to the list. For disposal of branches larger than 6 inches in diameter please refer to https://extension.psu.edu/spotted-lanternfly-tips-for-handling-yard-waste-in-quarantined-areas. We are in Spotted Lanternfly Quarantine area. Christmas Trees: Clear all ornaments, garland, lights, stands and any nails or fasteners. Place the tree in your front yard next to the sidewalk. No Alley pick up. Pick up start the first week in January. Please place trees out for pick up. Pennsylvania state law requires that televisions, computers and monitors be recycled and prohibits disposal as trash. Some of the curbside trash haulers will pick up TV’s for a fee. 1-800-GOT-JUNK or 1-800-HAUL-OUT or the GEEK SQUAD 1-800-433-5778 to come to your home to pick up your TV for a fee. There will be Recycling containers provided at all community events attended by 200 or more people. Please see Ordinance no 10-694-05 Recycling Containers at Community Events for more information. Souderton Borough is a member of the Northern Montgomery County Recycling Commission (NMCRC), a group of 11 municipalities that work together to increase recycling and promote recycling awareness and education in compliance with the state’s recycling law, PA Act 101 of 1988, as amended. For more information on the NMCRC, including recycling information, please click here.